Beautiful nature, landscape, and architecture photography of Loch Lomond & the Trossachs, Glasgow, and Stirling by Ian Cylkowski. I’ve driven Loch Lomond & the Trossachs many times, mostly to get to the likes of Glencoe and Skye. But in March this year, we decided to explore the National Park proper. This composition was taken from a spot called Rest And Be Thankful, named by soldiers who built the original military road through this valley (Glen Croe) in 1753. It was named so because the climb out of Glen Croe is so long and steep that it was traditional for travellers to rest at the top, and be thankful for having reached the highest point. Software: Adobe Lightroom CC and Photoshop CC 2019. Hundreds of millions of years ago, the landmasses of England and Wales were separate from Scotland and Northern Ireland. Eventually they collided together, and the evidence of this collision is found at the Highland Boundary Fault. It passes through the Isle of Arran in the Southwest to Stonehaven in the Northeast, crossing Loch Lomond and Callander in the process. Just north of the town of Callander you can hike down to Bracklinn Falls, a series of waterfalls and cascades cutting through a deep gorge that crosses the Highland Boundary Fault. The result is this dramatic scenery of gigantic boulders, deep plunge pools, and mossy woodland. On one of the more rainier days around Loch Lomond & the Trossachs, we decided to hop on a train and browse around Glasgow, Scotland’s most populous city. I’ve never been to Glasgow before and the city didn’t disappoint. One of the many sights we saw was the Kelvingrove Art Gallery & Museum, a gorgeous building designed in the Spanish Baroque style in 1901. In the Life & Expression gallery there were 10s of these disembodied floating heads, all with different frozen expressions on their faces. Creepy. But also cool. 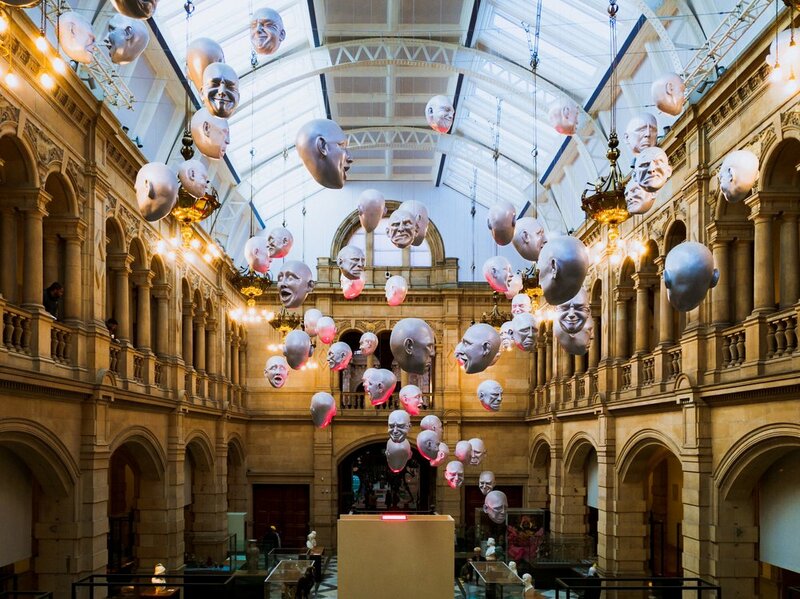 They’re an installation called “Floating Heads” by artist Sophie Cave. We arrived at our little cottage for the week after having very carefully driven through a blizzard. Whilst that meant we didn’t get to do or see much for the rest of the day, the following day was bright and clear, with pristine white mountains. We used this opportunity of good weather to park up near the shore of Loch Long and hike up the short but steep trail towards a famous Scottish mountain: The Cobbler (also known as Beinn Artair, 884m/2,900ft) in the Arrochar Alps. Whilst we didn’t get to properly see the mountain due to hill fog, the view back down was just as spectacular. There are a surprising number of waterfalls in the Loch Lomond & Trossachs National Park, certainly a lot more than I were expecting. By far one of the easiest to get to are the Falls of Falloch. Simply take the A82 north, beyond the shores of Loch Lomond, then follow the car park signs as the road heads northeast. A 5–10 minute walk from the car park brings you to this gorgeous waterfall. Easy. As you enter the Kelvingrove Art Gallery & Museum, the Centre Hall opens up before in all its splendour. At the time of our visit we were greeted by a full-size reconstructed skeleton of a diplodocus, known as “Dippy On Tour”, which was seriously impressive. Talking of impressive features, the Centre Hall of the Kelvingrove Art Gallery & Museum also hosts a huge illuminated pipe organ, commissioned at the same time as the building was constructed. It was demanded by councillors of Glasgow Corporation, saying that without the pipe organ “the art gallery would be a body without a soul”. The Loch Lomond & Trossachs National Park is a good area to explore and realise the meandering mazes of Scotland’s sea lochs. Loch Goil in particular puts me in mind of the fjords of Norway or Iceland. In fact, the Scots word “firth”—as in Firth of Forth or Firth of Clyde—comes from the Old Norse word fjorðr, which means that the Scots firth and the Norwegian fjord are related. You can thank the Vikings for that. This composition was taken at Bracklinn Falls, right on the edge of the gorge as you look down into one of many of the sudden drops here. There’s a bridge that crosses the gorge just a few yards to the right of this photo. Originally a steel construction that had been there for decades, it was washed away by a storm in 2004. Six years later a new wood and copper pyramidal design bridge was manually put in place across the gorge, all done by hand. Beautiful landscape, seascape, nature, and architectural photos of the Pembrokeshire Coast National Park, South Wales, UK by Ian Cylkowski. Beautiful landscape, nature, and architectural photography of the Brecon Beacons National Park, South Wales, by Ian Cylkowski. Beautiful landscape, nature, and architectural photography of Edinburgh, North Berwick, Dunbar, and St. Abbs, Scottish Borders, Scotland by Ian Cylkowski. Beautiful and unique landscape and nature photography of Summer in the Lake District and wider Cumbria, England, UK by Ian Cylkowski. Beautiful and unique landscape and nature photography of spring in the Lake District and wider Cumbria, England, UK by Ian Cylkowski. Having a "bad light" day? Maybe you just need to think and see differently.